You need an area to start the adventure if you want to run a fantasy roleplaying campaign. You can spend hundreds of hours creating your world and drawing your maps, but at some point, you want to get started with your game. Or perhaps skip the hundreds of hours, and start right away? This post is about creating a starter area and setting up a game as efficient as possible. The benchmark for all starter areas for fantasy games is probably the Keep on the Borderlands (1979) by Gary Gygax, and while it does not hold up to modern production values, all the critical elements are there. The home base is where the characters often begin and end their adventures. The home base is where they socialize, buy mounts and equipment, sell hard-gained loot, listen to rumors, do research, train and learn new skills, rests, and gets healed up. How do you create a fantasy roleplaying game starting area? It is a good idea to keep a few lists of names and short descriptions handy. You should prepare a list of news and rumors for the characters to pick up as they familiarize themselves with the home base. The purpose is threefold: (1) serve as hooks for adventures, (2) foreshadow future events and (3) create a sense of wonder and hint of a more extensive world, with emphasis on the first two if you to keep the players on track in the beginning. Some rumors should be false, as long they don’t send the players to far off-track. Travelers have spotted orcs on the road, and some merchants are missing. Hooded figures have been seen leaving the graveyard at nights, and the militia has found burned-down candles in odd places. Dark figures fled the scene when a farm burned down last week. Someone broke into the militia barracks last night and stole several bows and swords are. Four youngsters fought in the inn last night. Two of them, both known troublemakers, ran off swearing revenge. Noone has seen them since, and the locals fear the worst. A wounded bear is prowling the nearby woods and is likely to be dangerous. It must be healed or killed – the locals don’t care either way. You should pay close attention when the players discuss rumors and make up their minds about what they want to do. Listening to the players will give you plenty of ideas for twists and turns you otherwise never would have considered. Any adventurer should be able to respond to local rumors and news. It will suffice if you are short on time, and everybody is looking for a good time and roll some dice. Better yet is a strong hook that calls to adventure. A proper call to adventure need some consideration, depending on what characters the players want to play, and your larger schemes beyond the starter area. Still, there are many ways to keep everything within the starters area for a few adventures. The local lord is murdered, and the village rangers saw armed men heading for a local ruined keep. Orcs or brigands has set up camp in the wilderness beyond the village, and there are rumors of fighting in nearby villages. The region is at war! There have been rumors of a smuggling gang operating in the area, and the local authorities have arrested one of the characters’ relatives. The calls to adventure are no longer just rumors, the stakes are higher and involve the characters personally. Just like lists of names you should have a list of monsters you want to include – or possibly create a random table for the starter area, or find one in the rulebook at fits. Make sure you have the stats handy for each and that you understand them. Random encounters are never supposed to be the climax of the adventure, so do not worry about the details. Whenever the game seems stuck, have a pack of zombies claw their way up from a village basement, and mayhem ensues. Worry about the whys and hows later. The map was created with Campaign Cartographer 3 with the Mike Schley style. See www.profantasy.com for more information about CC3. You should have several dungeons available around the starter area. Several because options are nice and you want to give the players the opportunity to choose their path. Creating a handful of dungeons in advance may sound like a lot of work – and it can be, no doubt – but there are ways you can cheat. You should start your own library of stock maps you like. Check out Dyson Logos’ fantastic blog for free maps. Dyson has been doing this for years and you may never need to look any further than this blog for dungeon maps. 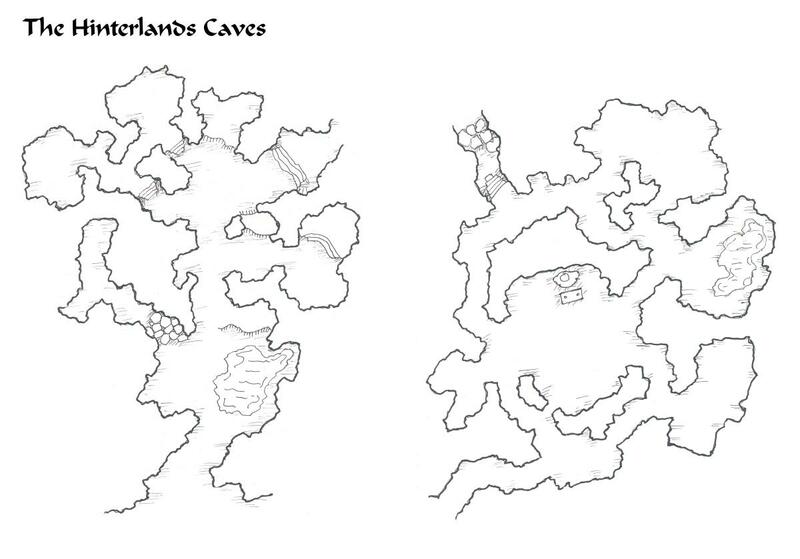 The Hinterlands Caves are perfect for a short dungeon crawl. Figure out your story, add some brigands, cultists, undead and demons, a few treasures, and hints of future adventures, and you are ready to go. Now that you have a few maps you like you need to stock them with monsters. Try to come up with encounters what may suit several maps to save time. Try also to include elements you have foreshadowed in the rumors, or your players have discussed all of their own. The orc lair is a forward post of the orc horde, complete with missing trade goods and human slaves. The lair may include the plans for a future orc invasion and perhaps clues of local collaborators. The necromancer’s lair is where the necromancer performs experiments and vile rituals. The retreat is guarded by skeletons and zombie guardians, and may also include allied brigands or smugglers. The necromancer’s treasure includes religious artifacts and eldritch scrolls from far lands. A band of brigands has a makeshift camp in the area where they rest and prepare for new raids. The brigand’s loot includes missing trade goods and perhaps even captives for the slave trade. A group of smugglers’ have a hideout in the area. Smugglers are by nature less likely to have guardian monsters and instead focus on hiding the lair and perhaps placing a few traps. The smugglers’ hideout is where they store illicit goods. An assassin has a safe house in the area and is well hidden and unquestionably trapped. The assassin’s belongings include disguises and evidence of foreign plots. Keep everything you did not use, and recycle and adapt whatever you create. There are many noteworthy starting areas in the Dungeons and Dragons tradition. Outstanding early starting area is the Village of Hommlet (1979) and the Keep on the Borderland 1979). Threshold in Karameikos is where my first couple of characters started out. Threshold first appeared in Dungeons and Dragons Expert Set, in what then was known as the Known World, and later rebranded as Mystara. The Expert Set only gave us a map and a page or two of background. Aaron Allston later expanded Threshold in The Grand Duchy of Karameikos (1987). The various editions of the Forgotten Realms have used at least two starter areas. Most important is, of course, Shadowdale from “the Old Grey box” and the 2nd edition of the setting. The current edition of Dungeons and Dragons is much more thorough with a dedicated starter product in the Dungeons and Dragons Starter Set. Port Nyanzaru in Tomb of Annihilation serves the same purpose as the keep in the Keep on the Borderlands but with a grander scale and modern production values. It may not necessarily be better, just shinier. Paizo Publishing seems to have picked up on this tradition with the village of Sandpoint as they kicked off the Rise of the Runelords adventure path and the Golarion setting. Dyson Logos has put together maps for sale as well. They are excellent and well worth the money. Enjoyed the read and the resources linked to are all great. Great! I am glad to hear it. The funny thing about the resources is that the Keep on the Borderlands and Dyson seem to be the most popular (the most clicks so far). That has a nice DIY vibe to it, and it makes me hopeful.